Lapis & Gold Bracelet! Gorgeous 14kt Gold cuff bracelet with a beautifully vibrant natural Lapis centerpiece stone. 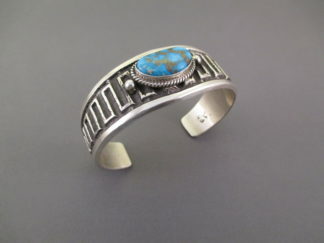 Absolutely beautiful cuff bracelet by Native American jewelry artist, Robert Taylor (Navajo). The blue & gold colors are stunning together! 14kt Gold cuff bracelet with 14kt Gold ‘Yei’ figures (Navajo Holy People) precisely overlaid onto the bracelet.